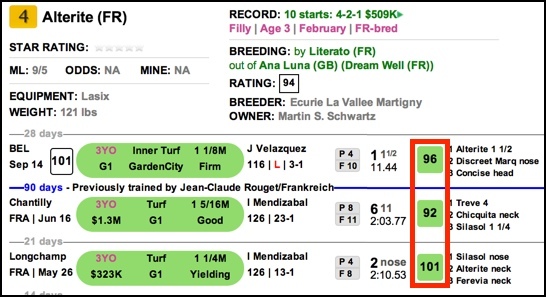 It's very frustrating when the 9/5 morning line favorite in a race has no significant advantage on speed figures, but you still can't muster up the courage to oppose her. Alterite just missed twice at the Group 1 level, by margins of only a nose and a head, back home in France. In her final French start, she was a soundly beaten sixth behind Treve, the eventual runaway Arc winner. In Europe, Alterite displayed a forward running style and gave the impression she was the kind of horse who might be helped by lasix. In addition, being transferred into the barn of training genius Chad Brown seemed almost certain to improve her. 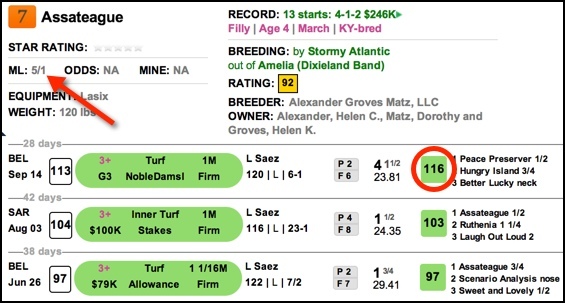 A glance at Chad Brown's TimeformUS Trainer Ratings shows an incredible nine Trainer Ratings of 100 (the maximum rating) in relevant categories for today's race. Alterite appeared to do more than just handle her business in her US debut in the Grade 1 Garden City. She relaxed comfortably behind a moderate pace, swept up three wide on the far turn, and always looked like the winner en route to a clear victory. We thought it was a visually impressive performance, and it came in a race that received a 101 Race Rating. However, her speed figure was only a 96. That figure might not be good enough to win today, but we're still unable to muster the courage to bet against her, even at a short price. The real reason we see for betting this race is exotic wagers, and the two horses we favor, Say (10/1 morning line) and Caroline Thomas (12/1 morning line), both offer generous value from an exotic standpoint. Say has many excellent speed figures and good European form, but she burned a lot of money with a terrible performance over boggy conditions last week at Keeneland. Normally, we would find it hard to make an excuse for any European horse who races over yielding conditions, but Say sharply improved her overseas form when she found "good" ground after a streak of nothing but mediocre performances over soft ground to start her career. Say has performed very well on short rest before, and I'm not sure her last race took much out of her anyway. Caroline Thomas is the other exotic use. She's been subjected to a steady diet of slow-paced races this year. But with three confirmed speed horses in this race (and who knows where Say is positioned going first blinkers over firm ground? ), that could be about to change, and if it does, Caroline Thomas is extremely dangerous. 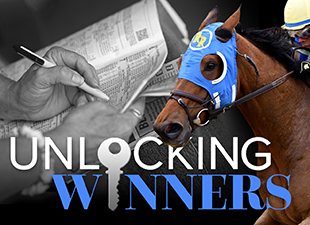 Betting Strategy: Exacta Key: Alterite on top. Say and Caroline Thomas underneath. There is a very interesting pace scenario in the Athenia. How things unfold on the front end will go a long way toward deciding the outcome of this race. The two horses with the best speed figures are the same two horses who, according to the TimeformUS Pace Projector, tower over the field from an early pace standpoint. If Assateague and Pianist can avoid an early confrontation, they'll both benefit. However, the one who backs down will give her rival the upper hand by doing so. If these two hook up, on the other hand, it will greatly benefit the chances of Samitar and Ruthenia. Ruthenia is the horse we like (and like a lot) on firm ground. Unfortunately, rain is in the forecast. The weather forecast and the pace complexion make this an unbelievably annoying race to handicap. 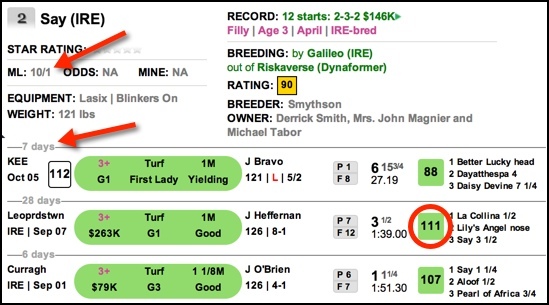 Let's just simplify it by saying that Assateague (5/1 on the morning line) was assigned a 116 speed figure last time out, and no other horse in this race has ever run a figure that fast. The hope is that Assateague avoids an early confrontation with Pianist. If she does, if she is able to rate, she'll offer great value. The Nearctic is fine on quantity this year, thanks in part to high-powered Woodbine trainer Reade Baker, who entered three horses. However, the race came up a bit light in terms of quality. In truth, it looks more like a Grade 2 than a Grade 1. But that quibble aside, it is an interesting betting race, with contenders all over the starting gate. The Pace Projector indicates that the pace of the race will favor neither frontrunners nor closers. It shows the venerable speedster Fatal Bullet on the early lead along with Bear No Joke, with morning line favorite Excaper forcing the pace from the outside. That's the first grouping. Then there's a small gap back to the second grouping, the stalkers: Bear Tough Tiger, Longhunter, and Phil's Dream. They are followed in close order by Strong Impact, Mr. Online, and Tripski. Riding the River is not far behind them, and Langstaff projects to have the whole field in view at the opening quarter. Mr. Online: His last-out speed figure of 110, earned in a Laurel turf sprint, puts him in a tie for best last-out figure in the race. At 8-1 on the morning line, we were itching to use Mr. Online today, but the combination of big jump to lifetime-top speed figure while lugging out practically to the outside rail is a double whammy. Too much for us to take as he steps up in class on the ship. He's a toss for us. Excaper: Getting into a speed duel in front of Wise Dan in the Woodbine Mile was probably not ideal. But he earned a strong speed figure of 108. And in his previous race, a turf sprint, he forced the pace three-wide and fought gallantly all the way. He makes his fourth start of the season today, cuts back in distance, and figures to be one tough customer from on or just off the pace. Strong, strong contender today. Riding the River: Exits the same race as Excaper but employed a wiser strategy. Earned a speed figure of 110. Has a back figure of 117 to aim at. At his best, he has a wicked late kick. Strong contender. Bear Tough Tiger: 12-1 on the morning line, and we think he has a shot to spring an upset today. His speed figures aren't quite up to the task in front of him today. He will almost certainly need to run a new top to win this race. But we loved his prep race in August. In a Woodbine allowance, he rated, hugged the rail, waited, made the inside-out move that plays well on Woodbine grass, and then pounced in supremely impressive fashion and won geared down. We think there is more horse here. And he has been pointed at today's race by a trainer who gets TFUS Trainer Ratings of 91 in turf sprints and 89 when attempting repeat victories. Bear Tough Tiger is our selection.